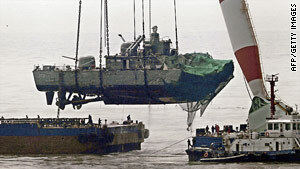 Seoul, South Korea (CNN) -- The U.N. Command is investigating whether the sinking of a South Korean warship, allegedly by North Korea, violated the armistice between the two nations. The United Nations Command said Friday it is convening a "special investigations team" from 11 countries will "review the findings" of an investigation into the incident and "determine the scope of the armistice violation." The nations are Australia, Canada, Denmark, France, New Zealand, South Korea, Turkey, the United Kingdom, the United States, Sweden and Switzerland. A South Korea-led international investigation into the sinking of the Cheonan on March 26 has concluded that North Korea fired a torpedo that cut the vessel in half, an incident that killed 46 sailors and an allegation the North strongly denies. The North said it wanted to send its inspectors to investigate but said South Korea could not receive them because it wanted the issue dealt with in the framework of the armistice. "It is the stand of the north side that there is no justification to plug such bogus mechanism as the 'Military Armistice Commission' into the case as it was faked up by the south side to be an issue between the north and the south from its outset," the North Korean government said in a message published Saturday by the Korean Central News Agency. The North said South Korea should "immediately receive" its inspectors and "produce material evidence without a shred of doubt" that it fired a torpedo at the ship.